Rose Pasquarello Beauchamp (BFA, Emerson College and MFA, CalArts) is a dance artist, somatic educator, filmmaker, and activist. She is a Certified Laban Movement Analyst (CLMA) which has rooted all of her teaching and artistic work in somatics and body awareness. As the Artistic Director of inFluxdance and Collaborator with SirensProof Films, her work has been featured in cities across the country and internationally. She has taught at various universities for the past 10 years including Alfred University, The College at Brockport, Dean College and the University of Virginia where, as the Head of Dance, she developed the dance program from the ground up. 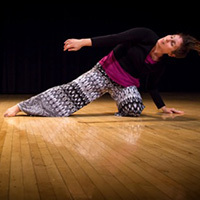 Much of her artistic research in the academic environment centers around collaboration across disciplines, finding ways to integrate dance with architecture, art, psychology, engineering, art, and music. She has spent a great deal of time presenting at international conferences and dance intensives with a focus on dance and social activism. Currently, Rose has been performing and presenting her research internationally. Her focus is exploring metaphor as it relates to socio-political art making. She will be serving as Lecturer in dance for the upcoming year.